Tube feeding, also called enteral nutrition, is a way of providing nutrition to your body. You might need to tube feed if you have a condition or illness that means you can't eat, or you can't eat enough. When you tube feed, a special liquid formula (also called feed) goes through a feeding tube into your stomach or small intestine. The formula provides all the nutrients you need to stay healthy. Where does the feeding tube go? Tubes can go to different places along your digestive tract. A nasogastric tube (NG tube) goes up your nose and down into your stomach. A nasojejunal tube (NJ tube) goes up your nose, down through your stomach, and into your jejunum, a part of your small intestine. A gastrostomy tube (G-tube) goes directly into your stomach through a hole in your abdominal wall called a stoma. There are two types of gastrostomy tube, a PEG (percutaneous endoscopic gastrostomy) and a RIG (radiologically Inserted gastrostomy). These terms describe how the tube is fitted. Your doctor will decide which type of feeding tube is best for you. Which feed will I have? There are different types of feed. Your dietitian will select one that best meets your nutrition needs. They'll also decide how much you need to have each day. Your dietitian will prescribe the feed and arrange to have it delivered to you. The feed is fully subsidised so there's no cost to you. There's also no charge for delivery but you may have to pay a prescription charge. How are tube feeds given? Either a feeding pump or a syringe can be used for tube feeding. Feeding using a syringe is also called bolus feeding. Your dietitian and nurse will give you all the equipment you need. They'll also teach you how to tube feed and look after your feeding tube. 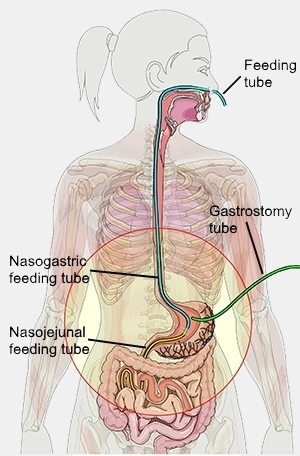 The pages about tube feeding with a nasogastric or nasojejunal tube and tube feeding with a gastrostomy tube have more details about the types of feeding. You can learn more about using a pump for tube feeding by watching these pump feeding videos. Written by HealthInfo clinical advisers. Page created April 2018.